I haven’t had a laptop for about five years now. Since getting an iPad I just didn’t find it necessary any more. So, whether I like it or not, everything for my blog has to be done on my phone or iPad. First, I write all of my posts in the Notes app – usually on the iPad, but sometimes on my phone if I’m out and about. The beauty of this is that I can carry on with posts wherever I am. My phone and iPad sync, so when I get home I can finish off drafts I started on the go. Next up, I paste the text into a new post on the WordPress app. I chose WordPress for my blog partly because people said it had a better app than Blogger. I do find the WordPress app pretty good and easy to use. It’s a shame you can’t add the ‘read more’ link from the app – I always have to go to the desktop site to do that. The best thing I ever bought for blogging is the lightning memory card reader. This means I can get my photos from my camera to my iPad. Once I’ve transferred them, I use Afterlight to edit my photos. I usually just crop them and brighten them, or adjust the colours slightly if they haven’t come out true to life. I am thinking of getting a laptop soon, because I’d like to go self hosted and will need to be able to do more behind the scenes on my blog. That said, I’m sure I will still do lots of my posts on the iPad – it’s such a quick and easy way to blog. 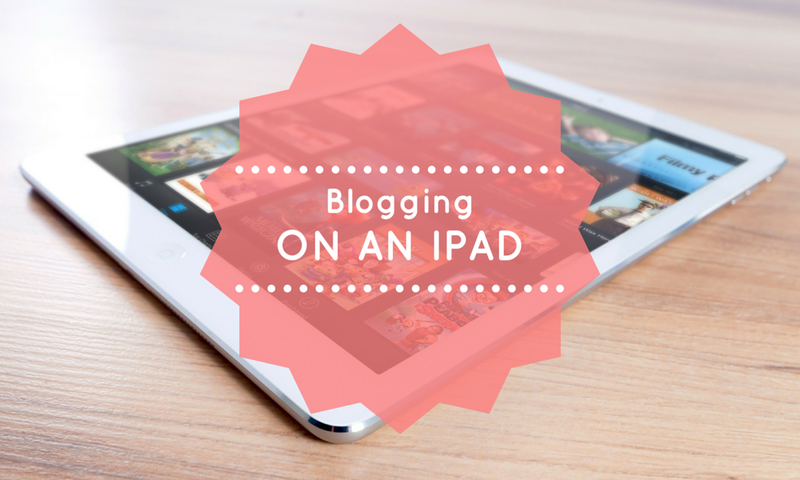 Have you ever done a post on an iPad? The card reader is brilliant. Glad it helped – I would love to read your travel posts! I do most of my blogging on my ipad – the writing part in particular. I like the portability of it and the WordPress app is great 🙂 When it comes to photographs though I have to load up the desktop. I do struggle a bit with the photos – it’s difficult to know which is which on the iPad! I agree it’s so quick and easy to write on though.